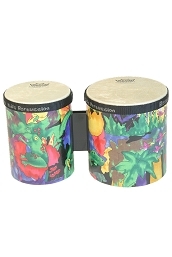 Bongo drums or bongos are a Cuban percussion instrument consisting of a pair of single-headed, open-ended drums attached to each other. The drums are of different size: the larger drum is called in Spanish the hembra (female) and the smaller the macho (male). It is most often played by hand and is especially associated in Cuban music with a steady patter or ostinato of eighth-notes known as the martillo or "hammer".